Size S of this colour will ship close to Aug 1, 2019. Learn More about special orders. 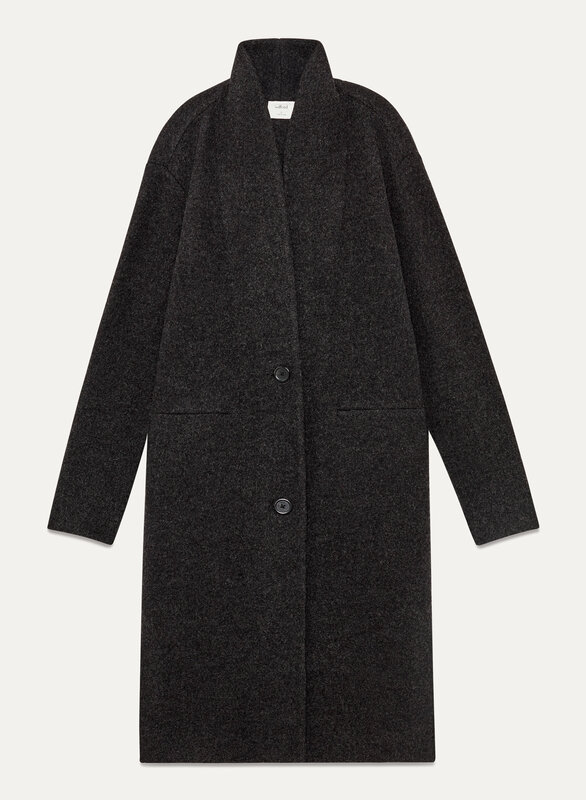 Love the style and fit, although the wool is not brushed therefore pulls easily. After a few wears jacket starts to appear worn out. Beautiful tailored jacket for any occasion! simply put, I LOVE THIS JACKET! So much so that I hurried off and bought another color in it. I get compliments everywhere I go by friends and strangers all asking where I got it. It is flattering, tailored and can be dressed up or dressed down! I have 2 of these and love how they can be dressed up or down. It's lighter than a winter coat but still cosy to wear on cool days. I love this sweater jacket and want it in every colour. I sized down because I found it too boxy. I would normally wear a small and went for xxs. I get compliments all the time and feel it’s just the right weight for spring and fall. It super soft too. Love this style, color ( I chose the mustard) the weight of the coat just right. It fits a tich small over my hips I’m usually a size small but am unable to get the bottom button done up but would buy the coat again . It’s a great find . Such a perfectly cute jacket. It's not too heavy so perfect for a mild temperate environment. The material does pill slightly but nothing a sweater stone can't fix! Nice length, I'm 5'9 and it's perfect on me. Enough room for a sweater under as well. It looks like a jacket but it's thin enough to wear as a sweater which makes it the perfect transitional jacket during the Fall/Spring! It does pill over time, but that didn't stop me from buying this jacket in 2 colours. It's extremely soft and comfy, not itchy at all. The pilling doesn't bother me at all because its really easy to just pick off! 100% recommend this! Fits true to size. I’m 5’6” 150lbs and medium is great. It’s so soft and comfortable. Extremely cozy and warm! Perfect for both casual days or more formal evenings. Very happy with my purchase. This sweater jacket is so perfect. Excellent fit and quality. I’d say it fits true to size. Super happy with this purchase. I love this jacket soooo much. 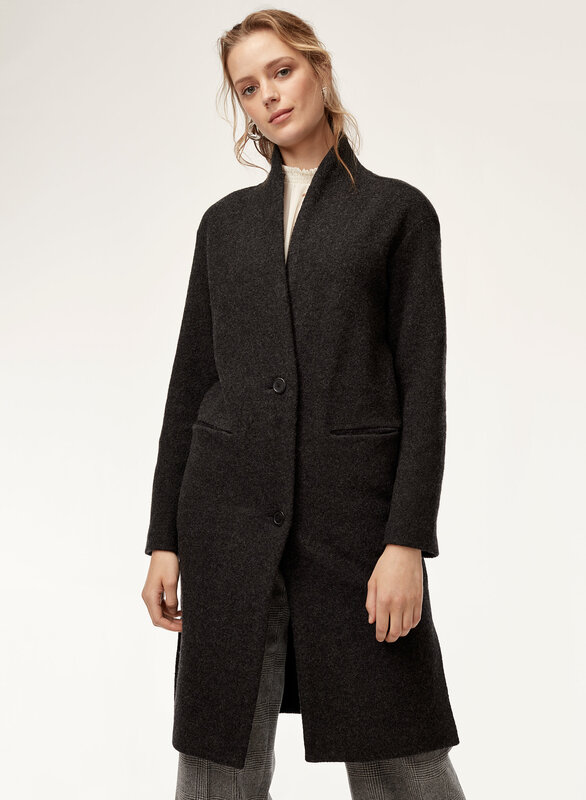 Super comfy like a cardigan but warm and cozy like a wool coat should be. Perfect length for petite girls. Long without being awkward, hits just past the knees for me and there are side slits so it’s not restrictive at all. 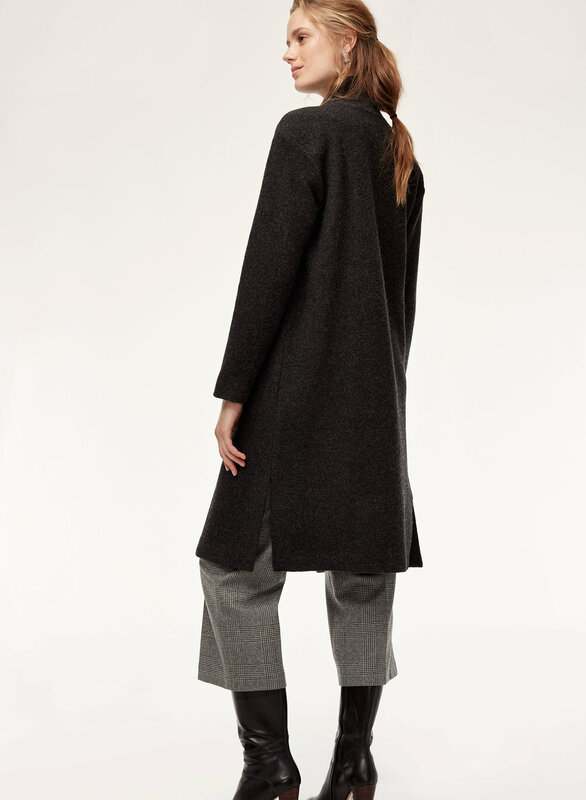 For that purpose, I chose this over the gornick jacket which has a similar silhouette but a tad too long for my height. I love this jacket to just throw on over casual outfits to give it a dressed up vibe, as the material is super soft and stretchy, and is very flattering on! Originally got this in an XS, it had weird peaks at the shoulders so I exchanged for a XXS. It fits perfectly now and is a gorgeous piece. It’s also quite warm. Perfect fall jacket, love it! I have this jacket in the heather gray and have also been looking for a nice tan color. I absolutely love it and it will be my go to piece for the spring/fall. I purchased the extra small as I like my jackets to be a little more form fitted and it is absolutely perfect. This is a nice jacket that can be warn as a sweater on cold days in the office. I got the jacket in cider gold and it matches almost everything. Add additional warmth when worn under an winter's jacket. After months of considering whether or not I should purchase this, I’m so glad that I did. The texture of this jacket might not be everyone’s favorite because it can look a bit “old-school”. The fit is true to size, for reference I’m 5’5 110 lbs and I got size XS. Really love this jacket. 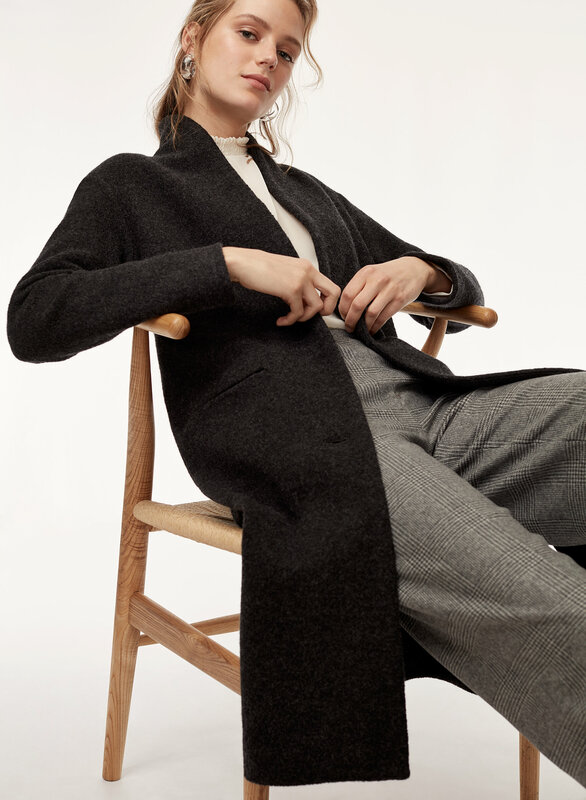 A nice weight you can wear indoors as a sweater when it’s really cold but can’t wait for Spring to use it as a light coat as weather transitions. Perfect shape. Sophisticated look. Layer it with a puff vest on colder days. I feel like the Dujardin is a classic timeless article. I wear it as a jacket outside vs sweater inside and gave bought in a couple colours. The white and cider gold as so beautiful in person! Sizing is inconsistent so I didn’t give 5 stars. Totally love how i can layer this. Pretty warm in this dry cold Edmonton weather. Great jacket, soft, lightweight, gorgeous design but the fabric pills almost immediately, basically on first wear, which is disappointing considering it’s an expensive piece. I’ve received so many compliments! It’s so comfortable and pretty warm. Perfect for layering over a t-shirt and jeans and so easy to dress up. I’d buy more colours if I lived somewhere colder. Purchased for an upcoming trip to Scotland and the sweater jacket is perfect. I am a true medium / sz 8-10, however the bottom button is a bit tight as I have a tummy and clings a bit to my rear in the back. I ordered a large, however I was swimming in it, so I kept the medium - which does looks very nice, just not as loose as shown on the models. I have 3 Dujardin Jacket\Sweaters and will likely get more. They are warm and flattering. I wear a little quilted jacket from MEC under them in colder weather and they are cozier than any of my puffers. And great for spring and fall weather too. The merino is warm yet breathable so you never get overheated wearing this jacket. So versatile. I have worn them with dresses, jeans, dress pants and my Camo Alix pants for entirely different looks. I bought this coat as a Christmas present for my daughter. She loves it and says it’s a nice lightweight coat to wear out for social events. Recommend for light weather days - great fit and lightweight! I purchased the sweater to wear with jeans. I am 5'3 1/2" and purchased the size small. It fits my larger arms and it has some room which is a more comfortable look. It's so comfortable-the material is not itchy! I'm usually a size small and it's true to size. 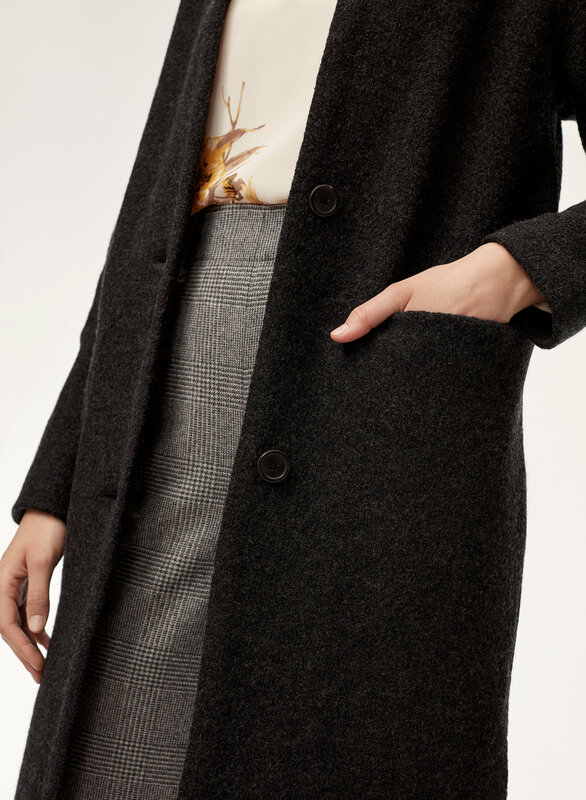 This coat fits like a glove and there's room to layer without looking too bulky. Such a gorgeous layering piece. I purchased the rose colour and was surprised that it didnt wash me out (blonde, fair skin). I sized down so that the coat was fitted on the sides rather than boxy. This coat is perfect for warmer winter weather and looks great dressed up or down. 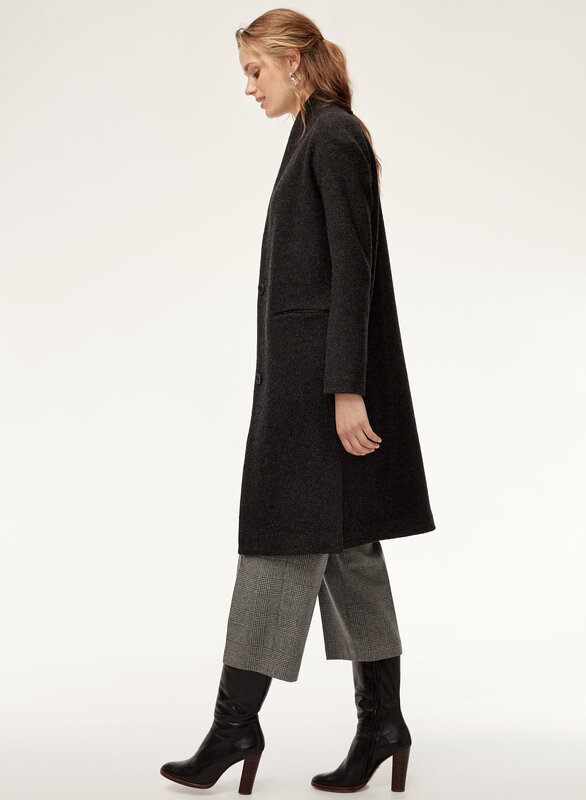 I have this coat in 2 colours and I love the fit and fabric.I wear it with dress pants as well as jeans and it looks so stylish. This serves me both as a sweater and jacket. It’s very classy and tailored fit. I wear it casually and if I want to dress up for evenings. I own them both in black and gray. I usually get M/L but opted for S. The downside of the material is that it quickly wears out on the elbows. So versatile! can be dressed up or down. Get one! I got the cream. Looks really nice but it sheds all over my clothes. So not good when I wear blk dress baby’s or dress. Love my new coat, I bought one in cream as well. I purchased this jacket in Pagan and it's so beautiful, fits well and warm. I want to buy it in different colors. Very well made. I sized up because I thought I was gonna layer thicker clothes but it’s super warm on its own so I exchanged it to xs. It looks amazing on and really comfortable. You can dress it up or down.